I’ve recently been looking into several different options for funding development of Toryansé full-time next year. The knock on effect of this has been me having to sort out several things that I hadn’t planned on dealing with just yet. A lot of the funding applications I’ve encountered require you to have registered as a limited company for example, a process that, although relatively straight forward, costs money and time, money and time that could be spent making cats. I’ve also had to work out a reasonably realistic schedule for completing the game and for that I’ve started using Hack’n’Plan. It’s still in beta and I’m not sure how it compares to other, industry standard tools but it suits me fine at the moment. Projects are broadly split up in a number of ways depending on the style of game, chapters, levels, objects or in my case locations. These elements can then be assigned tasks from various categories, programming, art, design etc. 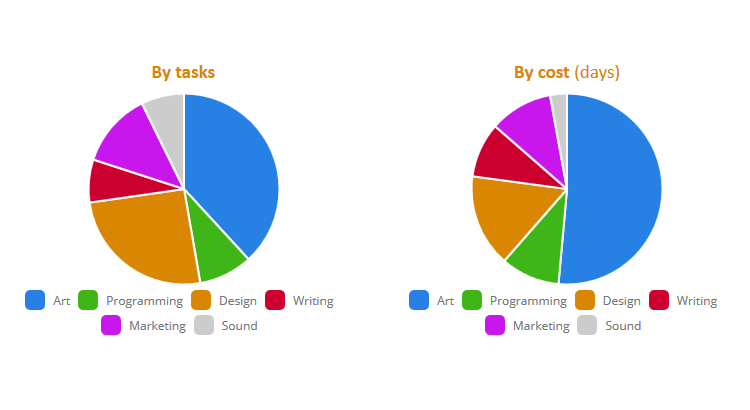 Each of these tasks can then be assigned a cost in terms of either hours or days. My first milestone deadline is at the end of December at which point I hope to have all the major systems for dialogue, save/load, interaction etc. in place. I also plan on having all the environments pretty accurately blocked in. My hope is that I’ll be able to focus almost exclusively on art next year, just dragging and dropping assets into the engine and quickly wiring up the interactions and puzzles with the systems already in place.